The importance of surface metrology has long been acknowledged in manufacturing and mechanical engineering, but has now gained growing recognition in an expanding number of new applications in fields such as semiconductors, electronics and optics. Metrology is the scientific study of measurement, and surface metrology is the study of the measurement of rough surfaces. 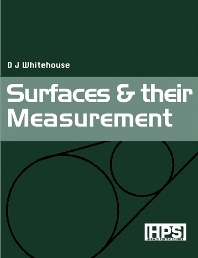 In this book, Professor David Whitehouse, an internationally acknowledged subject expert, covers the wide range of theory and practice, including the use of new methods of instrumentation. What is surface metrology? 2. Measurement of surfaces. 3. Profile parameter characterisation. 4. Surfaces in manufacture. 5. Function and surface texture. 6. Surface finish instrumentation. 7. Stylus instruments. 8. Optical methods. 9. Scanning microscopes. 10. Errors of form. 11. Roundness and related subjects. 12. Cylindricity, sphericity etc. 13. Instrument design for minimum error. 14. Calibration of instruments. 15. Sampling, numerical analysis, display. Glossary. David Whitehouse is Professor of Engineering Science and Chief Scientist at the University of Warwick, UK. Member or founder member of a number of international engineering learned and professional bodies, he is author of 180 papers, 22 patents and four books. He is consultant to leading edge instrument manufacturers, Taylor Hobson Ltd.